This entry was written by Tomás, posted on 29 April, 2009. Filed under In general and tagged copyright, Creative Commons, Godard, Jarmusch, Lessig. 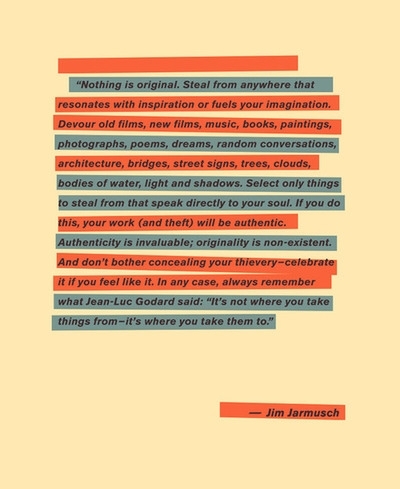 Taken from Jim Jarmusch’s Golden Rules, this poster explains the difference between authenticity and originality claiming than the later doesn’t exist. And with an interesting quote from the French filmmaker Jean-Luc Godard who pointed out that, finally, the end it’s much more important than the beginning. Note: I saw the poster in the KISD blog: Originality is non-existent.